CONNEX, Amimon’s new high-performance wireless HD video link for multirotor drone platforms, is a breakthrough transmission solution that makes it easy and affordable for professional drone users to outfit virtually any size and shape aerial drone with long-range full-HD video transmission capabilities. The innovative plug-and-fly CONNEX features unique video modem technology and zero latency. 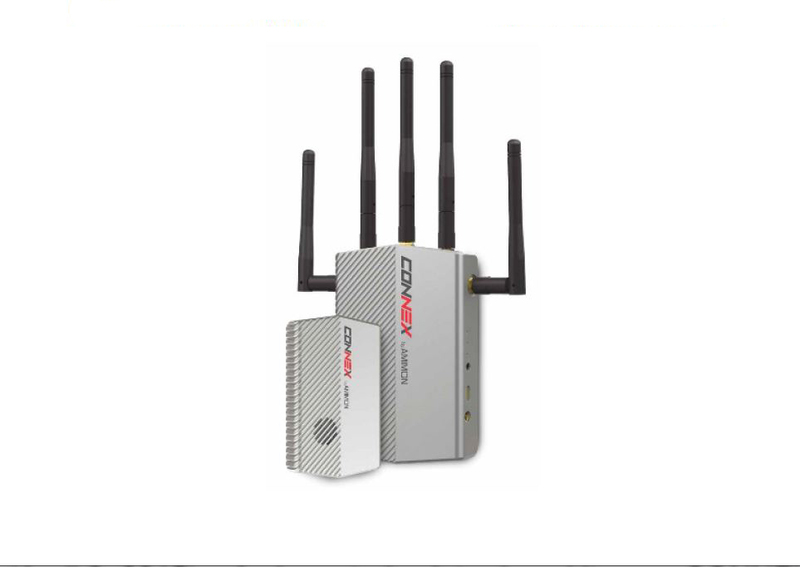 It utilizes robust 5GHz transmission frequency with sophisticated 2×5 MIMO and automatic channel selection to ensure resilient connectivity at all times – free from UAV control interference and other 2.4GHz radio links. A CONNEX system can support multicasting up to four screens simultaneously, while maintaining excellent HD video. CONNEX can transmit HD video up to 1000 meters (3000 ft) to the ground unit and is capable of displaying telemetry information using its built in OSD as well as sending control commands via an S-Bus protocol to the gimbal in the air unit. The small and lightweight package includes all antennas, cables and connectors required for air and ground unit setup, allowing for quick plug-and-fly experience on a wide assortment of aerial drones. CONNEX further expands Amimon’s offering of HD wireless video solutions with zero latency for the UAV market. Amimon’s technology is already being successfully used in film and television productions in industry leading transmitters such as the Teradek Bolt and Paralinx Tomahawk. With full HD video quality and zero-latency transmission, CONNEX is the perfect solution for broadcast, inspection, aerial photography, crowd control, and myriad applications that require control of both the camera and drone in real time. And CONNEX is available at the highly competitive and attractive MSRP of $1,599. Amimon’s main booth is located in the Central Hall booth #C9149. Click through to www.amimon.com for more information on this industry changing product!